How tall would Samus Aran be in real life? The seller on this eBay item claims that it's life-size so, if this crafty piece of artwork's to be believed, she'd be about 5'6" (165 cm, for you metric-heads). 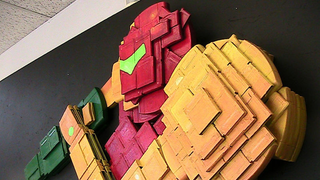 The sculpture's made from defunct Nintendo games from the Japanese publisher's legacy systems, like the Game Boy, Nintendo Entertainment System and Nintendo 64. Originally commissioned for used games retailer JJGames, it now needs a new home. Surely some retro enthusiast out there can give Samus a loving home?